Lady of the Wood, by Alaskan carpenter David Walker, is just that: a mannequin sporting an eighteenth-century ball gown crafted entirely of mahogany, maple, cedar, and lacewood. 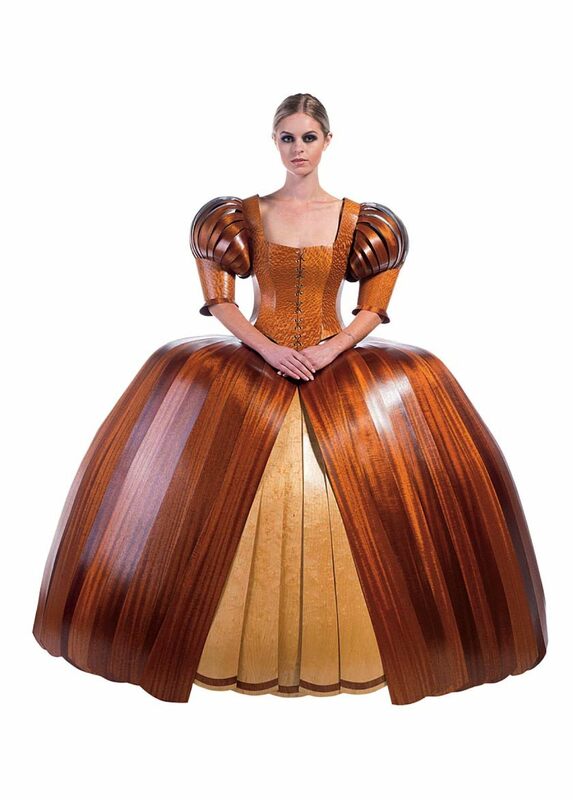 Walker steamed, bent, and polished timber to form a hooped skirt and “puffy” sleeves cuffed by fine-grained lacewood that matches a dainty bodice. Some 32 such ingenious ensembles—selected from winning entries in New Zealand’s annual design competition WOW® World of WearableArtTM—appear at the Peabody Essex Museum through June 11. For 25 years, the popular competition has drawn a diverse set of artists who vie to merge fashion and high art. New Zealand jeweler Sarah Thomas, inspired by the shiny, sleek lines of vintage cars, created her own spunky, don-able version, American Dream, from papier-mâché, builder’s foam, and vinyl. It lacks an engine, but who wouldn’t want to cruise through a party dressed in the ’57 Chevy Bel Air classic?